If you need a heavy duty plier stapler, then consider the Bostitch P50-10B Pneumatic Plier Stapler, which is known as one of the best plier staplers in the packaging industry. The Stanley-Bostitch P50-10B Pneumatic Plier Stapler is a stapler that is used to assemble corrugated trays and close box sides with a medium crown staple. This product is an air driven, pneumatic device. This benefit increases operator productivity thus saving time and money in your carton closing operations. The P50 – 10b also has the benefit of an optional foot pedal switch attachment which allows hands-free work, and associated increases in productivity. The foot pedal switch can be optionally linked to several staplers at once so that all the staplers fire in conjunction at the same time While the Bostitch P50-10B plier stapler is very easy to use, it is also very powerful and effective. This box stapler fires a 3/8” to 5/8” Bostitch SB103020 staples. These staples can bind a double wall box and a variety of corrugated with ease. 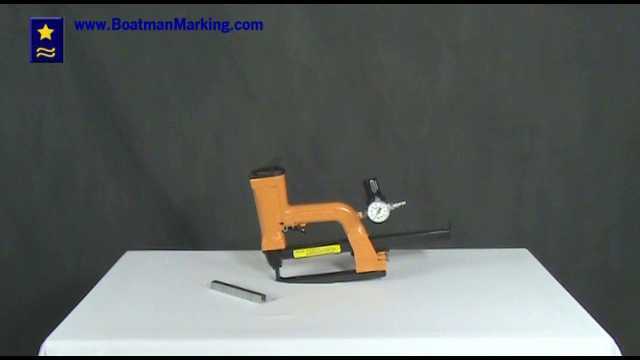 Bostitch staplers, such as the Bostitch P50-10B pneumatic plier stapler as well as the parts and staples for these products are available at Boatman Marking, Inc.